Nintendo have shared new details regarding Fire Emblem: Awakening within the latest issue of Japanese magazine Jump. It also detailed the central protagnoist Krom, a prince from the Kingdom of Iris. As fans previously speculated, he is a Lord class and wields a weapon known as a ‘Sealed Sword Falchion’. Krom won’t be the only main character, however, with the game allowing you to create your own unit, gender and facial features amidst other options. The character created through this will serve as the other main character within the game and will play a major part within the overall story arc. A duo of gameplay components were also detailed; Free Maps, a returning feature that allows you to freely move across the map to buy goods or take part in battle; and the Dual system, which triggers once you enter a battle whilst next to an ally and means that you will enter the battle together. This will grant your character increased abilities and the ally will also aid you in battle. 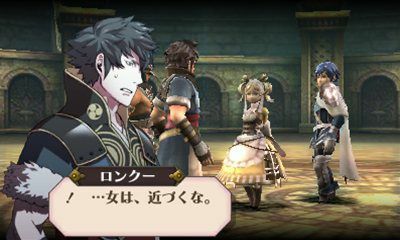 Fire Emblem is set to release across Japan on April 19th.